The Museum of Science and Industry in Manchester will open a new exhibition this month called Cloud Crash. The exhibition, which will focus on climate change and support Science studies, will run until 3rd February. Three new site-specific works have been created for the exhibition. These works depict micro-climates and manufactured airspaces of artificially engineered clouds, in what’s described as an imaginative appropriation of atmospheric cloud research. 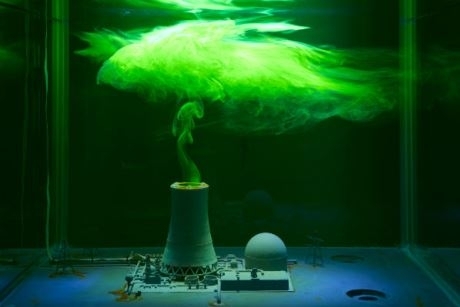 The exhibition also portrays the effect of human action on the environment – in a number of technicolour displays. The works have been created by Paris-based artists HeHe, who are said to have taken inspiration from English scientist James Lovelock. In their engagement with the industrial landscape, HeHe blur the boundaries between natural and man-made clouds. Cloud Crash will be free to enter. The Museum of Science and Industry has a programme of interactive shows, workshops and other learning activities for Key Stages 1, 2 and 3. Teachers can create a day-long Science-themed itinerary by following a visit to Cloud Crash with another activity. Options include a Creative Science: Wonder Materials workshop, and Circuit City, which is an interactive Science show. Creative Science: Wonder Materials will see students take part in material science experiments and examine other materials under magnification, before designing new material applications and products. Taking part in experiments, students will understand that materials have unique properties, which can be changed through processing or combined with others to create composites. Pupils watching Circuit City, meanwhile, will watch a representation of an electrical current in 1893 go from Dickinson Street Power Station to Manchester Town Hall, as the city is powered by electricity for the first time. The group will learn the basic principles of electricity, including creation, conduction, insulation, storage, safety and different uses including light, sound, heat and movement. For further information on educational opportunities at MOSI, teachers can visit www.msimanchester.org.uk/schools.